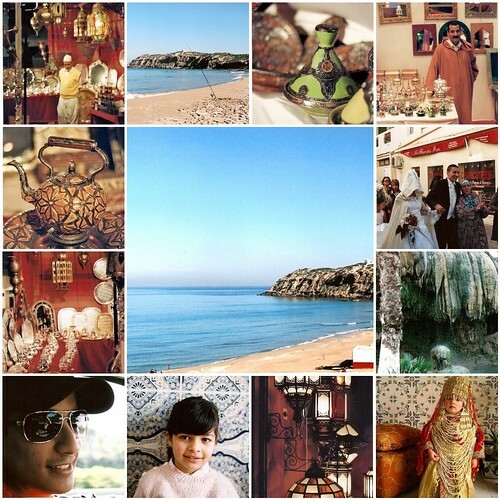 My trip to Algeria was about spending time with my family and friends, soaking up the sun, the blue sky and the sea; introducing my daughter to her origins, to my country, to my continent, to the place where her dad and I first met, to her cousins, her big and diverse family. Our trip was about love, fun and food. We were six under the same roof. Every morning, my daughter would run down the stairs and into the kitchen to jump into my father's arms before sitting on his lap and take a sip from his coffee. My mother would already be wrapped in her apron doing important things like sweating some onions or dicing some vegetables. Breakfasts were toasts, caak, croissants, pastries, for the brave souls, which I am not, and m'semmen for special days and weekends. Mornings were laid-back, evenings were lingering with tea and sweets at 6PM and chocolate and dates at 12AM. My husband then joined us, followed by my sister, her husband and her three kids. We were then twelve under the same roof. There was no need to turn on the heating and no room to feel lonely. Some of us enjoyed spending time in the family room, others, like myself, snuggled in my parents bed watching cartoons with the kids. But the kitchen was where we all came together. It was in the kitchen where we laughed, argued, ate delicious meals, relaxed, danced, teased one another, where my daughter had her first earrings, where twice a week I ironed my father's shirts, where my sister nursed her one month old son, where my father reads his newspapers, where my husband had his first roasted lamb's tail and where I covered my eyes to avoid seeing such things as people eating lamb's tail. But let's not talk about animal parts today. I'll leave it for later, for the brave souls. Today I want it to be special. As you have always been so nice to me, I want to share with you a recipe I should have told you about a while ago, as it is my favorite of all. I believe if I had one last meal, this dish would be on my table no doubt about it. This is my mother's spicy greens with bulgur. The spices and the cloves of garlic are pounded using a mortar and pestle to extract as much aroma before adding the resulting paste to the "sweaty" onions. As you pour the stock over the lovely ochre colored onions, restrain yourself from dipping your bread, or your fingers, as the sauce gets ready for the bulgur. At the end, steamed spinach and arugula join the party; a party that took half an hour to put together and will take half the time to gulp down. It's exquisite, I assure you. It's even exquisite the following day straight from the fridge, sitting on the countertop with a piece of bread in one hand and orange soda in the other. Every bite brings with it a part of home and my mother's kitchen into my own kitchen. Wash the spinach and arugula. Drain off the excess water and put them in the basket section of a steamer. Cover and steam over simmering water until the greens just start to wilt, but still have their vibrant green color, about 5 - 7 minutes. When cold to handle, squeeze the water out of the greens and chop roughly. Set aside. In a pan, heat the olive oil. Add the onions and cook on a medium heat until translucent but not brown, about 5 minutes. Meanwhile, pound the garlic with turmeric, cumin, and pepper flakes to a paste using a mortar and pestle. Add the garlic paste to the onions and stir to incorporate. Add The tomato paste and the stock and bring to a boil. Add the bulgur and stir again. Lower the heat to a gentle simmer and cook covered until the bulgur is tender, about 15 minutes, depending on the variety of your bulgur. Uncover the pan and add the steamed greens and the herbs to the sauce. Stir and cook for another 2 minutes and then remove from the heat. Season with salt and pepper and serve. The dish keeps well in the fridge for up to 2 days, although I never recall keeping it longer than one day. Laver les épinards et la roquette. Essorer le plus de liquide possible et les faire cuire a la vapeur jusqu'à ce que les feuilles commencent a "fondre" mais tout en gardant leur belle couleur verte, environ 5-7 minutes. Essorer l''exces d'eau et hacher grossièrement les herbes. Mettre de cote. Dans une poêle, chauffer l'huile d'olive. Ajouter l'oignon et laisser cuire jusqu'à ce qu'il devienne transparent, mais sans qu'il caramélise, environ 5 minutes. Entre temps, a l'aide d'un mortier réduire les gousses d'ail et les épices en une pate. L'ajouter aux oignons et tourner a l'aide d'une cuillère en bois. Ajouter la tomate en conserve et le bouillon. Porter a ébullition puis verser les graines de bourghoul en pluie sur le bouillon. Réduire le feu, couvrir la poêle et laisser les graines cuire, environ 15 minutes. Découvrir la poêle et ajouter les épinards, roquette, persil et coriandre. Remuer encore avec la cuillère en bois et donner un autre bouillon avant de retirer du feu, environ deux minutes. Gouter et assaisonner de sel et poivre noir si nécessaire. Servir. Ce plat se garde bien au frais pendant deux jours, mais j'avoue ne l'avoir jamais garder plus d'un jour dans mon frigo car il est irrésistible. Wonderful to have you back, Warda. And your description of home was beautiful. Thank you. I am so glad to have found your blog. Everything is beautiful - the photos, the writing, and of course the food. I'm excited to find Algerian recipes too. Just wanted to say hello! Glad to see you back and writing recipes again. Gorgeous photos too! This sounds really delicious. And, beautiful photos! This looks wonderful, and full of spice. Thanks for sharing! 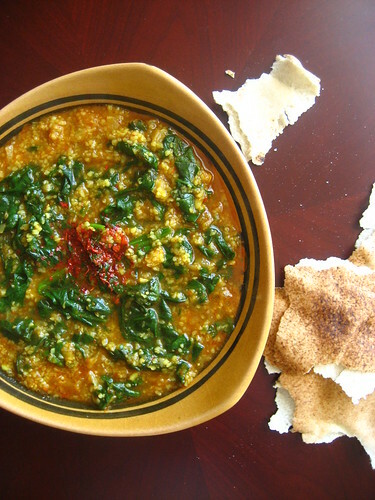 Not only is this a spectacular recipe, Warda, but reading your blog is like taking the very best vacation. Oh, you've made me so want to visit Algeria. It's so good to have your posts back. This sounds so delicious! I first ate bulgur and greens a few months ago, and I've made it at least 5 times since then! This version looks awesome. Thanks for passing it on! Great photos warda, can't wait to try this dish! I made this tonight. It was killerly delicious. AND nutritious, AND cheap, AND easy, AND fast. It's going in the regular rotation. Thanks! You have an absolutely beautiful site, and the pictures are REALLY appealing! This is my first time visiting, but I've already added you to my favorites. Am so ready to jump on your scrumptious recipes! Yum--made it tonight and the husband and I gobbled it all down. I understand why you can't testify to its staying power for left-overs--we don't have any here to test! Beautiful to read a bit about your trip. Lovely dish, worth a try since you say that it is your favorite. Ça a l'air vraiment bon. Je vais le faire demain soir. Cependant, je crois qu'il y a une petite heure dans ta recette en français: le "bulgur", ce serait du "boulghour", non ? Pas de l'orge... (barley). Je suis un peu confuse, je ne sais pas lequel utiliser :-) Mais d'après ta photo, ça ressemble à de la semoule de blé, pas à de l'orge, alors j'irai pour le boulghour. I love all the colors in this dish! It sounds wonderful! And your photos are all stunning, especially the shots of the beach. Thanks for this wonderful recipe on the MFLB blog. I've added your blog to the list of contributors. - Muneeba, welcome and thanl you for your kind words. - Kate, (smiling here!) I think you were the one who didn't get much left at our last get together. I'm so happy you guys enjoyed it. - Gretchen, thank you! You won't be desapointed, and please report back if you make it. - Melodie, tiens moi au courant du resultat, STP. Et merci pour m'avoir corrige. Je n'etais pas sure moi-meme. - Maggie, thank you, my dear. Hope you're all doing well. You have the most lovely writing and that last picture with the chedda is beyond adorable. Too darling for words. thank you kindly for your blog. Before I felt so low, but now I'm going to try your dish. All this alluring colors and invisible smells already make me feel better. Oh , I'm so glad you're back ! I've missed the delicious food and the warmth ! I love your blog mash'Allah! U made me miss algeria!!! Love, food, and fun? It doesn't get much better than that. And that dish looks spectacular, like a shot in a magazine. wow life in algeria sounds exciting! and what a beautiful dish! Je suis ravie de découvrir ton blog!! !Les photos sont magnifiques,un air de nostalgie m'envahit du coup........A bientôt! Looks so good, lil similar to Haleem perhaps. C'était excellent! La photo est ce qui m'a d'abord conquise, mais le résultat était aussi bon. Tout le monde a aimé. Aucun reste :-( On va la refaire ! Merci pour partager ton retour au pays et ces belles photos... je connais un peu l'Afrique du Nord et par tes mots, tes photos j'ai pu voyager quelques instants dans ce monde magique! Tres belle photo, recette tres appetissante.... puis je l'essayer avec de la semoule de couscous? I just made this and it is really delicious. Four servings? I'm trying not to eat the whole pot myself! 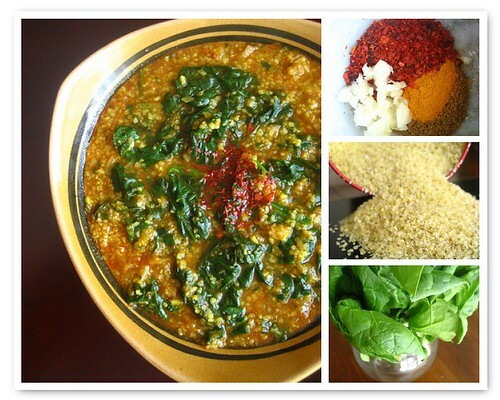 Your pictures look beautiful (the ones of Algeria and of your mom's spicy greens with bulgur). Warda, I want to make this but have not yet found bulgur. do you think i could get close with cracked wheat because I have found that. - Thank you all for your words and kindness. - Tony, Allah Yssalemak! And really sorry about no being able to send you a reponse about the contest :( Next month, I promise! - Shayne, actually, my dear, cracked wheat is just another name for Burgul. So go ahead! And let me know how you like it :) Hugs and love! I thought that but when I googled it I was not getting any good answers. Great I am making it today! It's lovely to have you back. Delicious looking dish--and beautiful pictures! this has become my new favorite dish when i want something delicious, satisfying, and comforting. Better than my own culture's chicken soup. I look forward to more of your recipes that evoke your home. I love your blog - beautiful photographs and recipes. I am just wondering about this recipe: do you only use 2 tablespoons of bulgur? - Tycha, Yes, you only use 2 heaping tbsp of bulgur, as it tends to absorb liquid more than you think.Then you let it reduces just to a thick sauce. Use the fine variety of bulgur not the large one. I find the later to be too though for this recipe. Hope you'll like it, and please do let me know when you can. I made this for dinner last night, and it was so good! Even my meat-loving husband liked it. I'm trying to do several meatless meals a week both for our health and our budget, so I really appreciate easy, veggie packed meals. Great blog! Thanks for the Tchicha bel Khoubiz recipe. Last summer I ate them at a party and has been looking for an authentic recipe ever since. Now I will be able to make them myself. Thanks again. I made this for supper today, it was delicious! Thanks for your great recipes. I was just reminded of this dish on Blogher. I was inspired once again. hi i want to try this today but the only bulgur i have is whole grain bulgur...will it still be good for this recipe? ?please help! - Whole grain bulgur will absorb more water, so keep an eye on the liquid and add little at a time if needed. Just discovered your blog and this entry last night when I wanted to cook some bulgur I had in the house. Using only what I had, I substituted curry for tumeric and swiss chard for arugula. I wilted the greens over some strips of beef I cooked in a touch of oil, salt and pepper. We stirred everything together and spritzed a lemon over. It was one of the BEST dinners we've eaten lately. I just devoured the last of it for my lunch today. I've also read a lot of your blog when I should be working this morning! Great posts, pictures and stories. I look forward to hearing more from you! Thanks for this recipe, I can't wait to make it true to form instead of the different (albeit delicious) version we ate last night. Cheers! Warda I finally gave this a try with just a few little changes, mainly due to not having all the ingredients specified on hand, and it was beautiful. I can see why you love it. Thanks so much for sharing. this meal is delicious! I'm living in hong kong so it's hard to find the same greens, but I just substituted chinese greens for the spinach and arugula and it still came out delicious!! I now double the recipe, make it sunday nights and my husband and I take it to work for lunch all week. I don't know when or if we'll ever tire of it. so delicious and healthy. even my 2 yr old daugther can't get enough (she drinks water after every bite, lol). thank you so much for sharing! your writing, the pictures, the food- all beautiful! - Kimberly, welcome! I'm sure my mother never expected her recipe to go all the way to Hong Kong ;) That's the magic of the internet and I'm so happy to hear this humble dish of mine became a tradition in your kitchen and your family as well. Your daughter sounds so precious! Thank you again for the time you took to leave me this message. Wow, can't wait to try your recipe...it looks delicious! I just have a question on the amount of bulgur called for in your recipe...2 tablespoons? Is that right, to serve 4 people? Thanks. Judy, sorry for the delay and yes, it is correct, don't worry. Bulgur tends to absorb a lot of liquid and you can always reduce the sauce to your desired consistency. happy cooking! I make with Kale, witch is stronger tasting. would be a better choice? Anonymous, I would say swiss chard is your best bet then you can keep the arugula or just go with the chard by itself.